Once again, Invisible Bordeaux has delivered a "listicle" to the good people of easyJet Traveller magazine, and you can read the article on board the airline's entire fleet of aircraft as they criss-cross Europe throughout the month of August 2018. This latest article compiles a number of places in Bordeaux which would form the perfect setting for scenes from a classic French movie. 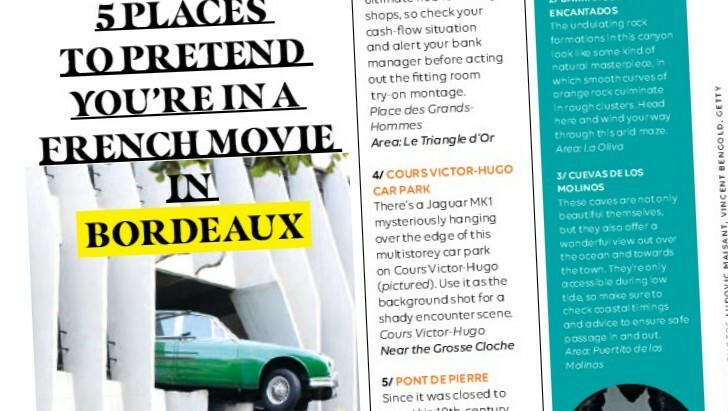 Where then should you go to act out the boulangerie scene or to do some serious café terrace people-watching? Where is the best neighbourhood for some clothes shop fitting room action, a shady car park encounter, or a romantic stroll on a bridge? All the answers can be found in the article! > The August issue of easyJet Traveller can be viewed in its entirety here.